LIVE - \‘liv\ v.: To pursue a positive, satisfying existence; to enjoy life. 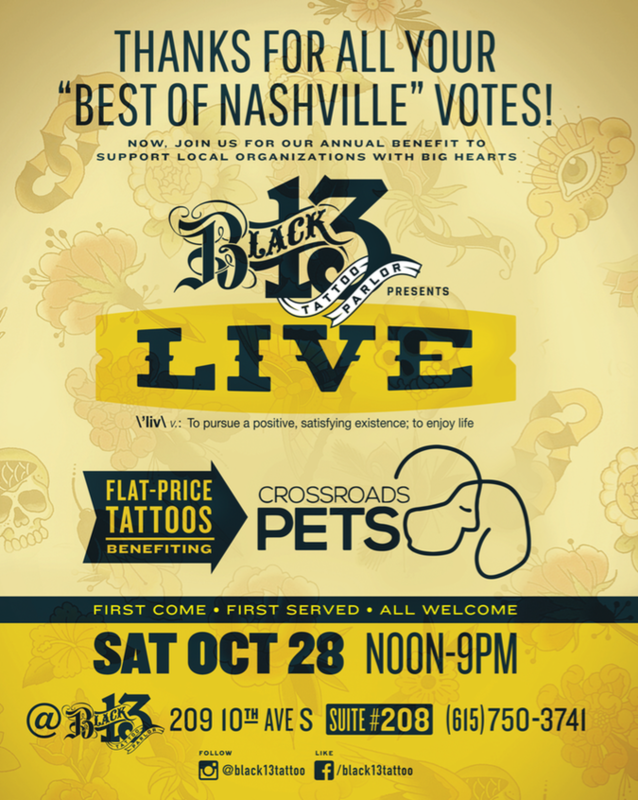 In partnership with and support of Nashville, Tennessee based Crossroads Pets, Black 13 Tattoo Parlor will host its fith annual LIVE event on Saturday, October 28, 2017 from 12 p.m. until 9 p.m. Black 13 artists will tattooing custom flash art at a set price of $100 and $150 and on a first-come, first-served basis. 100% of the proceeds will go to support Crossroads Pets. Flash sheets and stories about the pets and people involved in Crossroads will be posted on our FB event page prior to the event. Crossroads Pets – Shop & Adopt is a neighborhood “pet store” where rescued dogs and cats are available for adoption and young people receive mentoring, job training and the opportunity to experience the unconditional love of animals. Love heals, and powerful life lessons can be learned through caring for others. This concept is at the heart of all that we do at Crossroads Campus. We have a deep love and appreciation for two-legged and four-legged members of our community and work hard to better the lives of both through the healing power of the human-animal bond. We are a non-profit 501(c)(3) with a passion for creating and fostering caring connections between people and pets. Through our diverse programs, we bring people from all walks of life together to make a difference in the lives of homeless animals and young people in the community. - For more information please visit https://crossroadscampus.org.